Save $45 more on Rowenta Soleplate Cleaner Kit, Dritz Ironing Blanket, plus 2 Year Extended Warranty Enhancement: Repair Parts and Labor, Power Surg, Transfer Owner, No Lemon, Replace or Buyout % Depreciation, for Non Commercial Use in the USA. The iron is 7.25" total length. Maximum width is 3.5" and tapers to about a 1/2" curve at the tip. Compact Size - Weighs 1.65lbs and folds to 7.8 inches. Microsteam Stainless Steel Soleplate provides a smooth surface with superior glide. High precision tip delivers steam and pressing into hard-to-reach areas. Features True Dual Voltage, two heating elements ensure the iron is as powerful at 120 volts as it is at 240 volts. Also features 3 way steam - Vertical, Constant, and Steam Bursts. The steam function can also be turned off for those occasions where steam is not needed. Weight: 1 pound, 9 oz. Loved this iron. Used a friends this weekend at a quilt retreat. 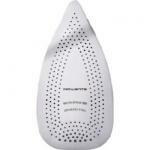 I like my new travel iron....love the Rowenta product! Like the starch too! Will order it again. First time ordering from this company. I would order again. Have always been very pleased with the service from Allbrands! Very, very pleased with this transaction. I WILL use AllBrands.com again! Easiest and fastest purchase on net I have made. Received quickly and item works well. Thanks!! Thank you for your prompt and professional response. It was greatly appreciated. Couldn't be more satisfied with my first purchase from you. Your prices beat the rest so I'll be back.